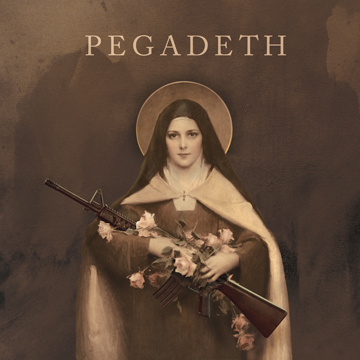 Aptly nicknamed “Pegadeth” by a fellow soldier and bandmate while serving in the Army, and referring to her wielding both an M-16 and guitar, Peggy Doyle says the name just never left her. Many years, and bands later she recruits 4 of the finest musicians she can find and brings them together for this PEGADETH project; Her induction list included every single woman from the following bands: Helms Alee, He Whose Ox is Gored, Post/Boredom and Brothers of the Sonic Cloth. Doyle says of the creation of the songs: “Once we all started to work together, it became quickly evident to me that this should be a very NW record, a recorded moment in time of 5 women, all in, bands in Seattle who are representing the heavier rock side of the city.” This 3 song EP was recorded and mixed by the iconic Tad Doyle at Witch Ape Studios and mastered by the respected NW mainstay Chris Hanzsek. With a rhythm section as formidable as Hozoji Matheson- Margullis on drums and Dana James on bass (Helms Alee), combined with the guitar prowess of Pamela Sternin (Post/Boredom & touring guitarist with BOTSC), and the ethereal synth of Lisa Mungo (He Whose Ox Is Gored), you could expect to hear some journeyman level playing. Add to the sonic scape Peggy’s unique, non-conformist guitar bent, and lyrical/vocal style. Her distinctive song arrangements come together with the band as a passionate singular vision – focused and authoritative. The music that comes forth is authentic, unalloyed and a refreshing take on hard rock. These are three songs about living, dying and killing that are an anthemic manifesto of sorts with dark overtones and even darker lyrics. The cover art alone is worth the price of admission to this first offering of PEGADETH. You can download the EP here on bandcamp at this location. You may purchase physical copies of the CD here at CD Baby at this location.